Last weekend, Amsterdam was all about European art and culture. For the second edition of the Forum on European Culture, De Balie and DutchCulture organised theatre and dance performances, lectures and debates, a spoken beat night and a genuine European cultural laboratory at more than 10 venues throughout the city. With more than 220 artists and thinkers from more than 30 countries, the conclusion was clear: Culture is the only way to go forward. It’s time to Act for Democracy! • The 4-day festival drew more than 7700 visitors, which surpassed all expectations. To compare: in 2016 the Forum drew 3700 visitors. • We received guests from more than 30 countries around the globe: from the United Arab Emirates to the US, fromIreland to Spain, from Mexico to Palestine, from the Netherlands to Belarus. • Media from all over the world reported on the festival: of the 146 publications devoted to the event, 64 appeared in international media and 82 in domestic media. The festival was attended by 14 international and 38 domestic journalists. • European art and culture were celebrated at 10 venues throughout the city of Amsterdam: Stedelijk Museum, Concertgebouw, De Balie, Rijksakademie, Theater Bellevue, Frascati, Stadsschouwburg Amsterdam, Melkwegand not to forget the NDSM ferry and metro line 53. • Visitors had a choice of 3 exhibitions during the festival: The European International at the Rijksakademie,Santiago Sierra’s Political Prisoners in Spain in the streets of Amsterdam, and the What if? pop-up museum in the upper foyer of De Balie. • 30 programmes were streamed live online. More than 20,000 people viewed these livestreams. “My work is inspired by the greatest European artists like Auguste Rodin, Piet Mondriaan and Eric Fischl” – Russian photographer Sergey Ponomarev – winner of the World Press Photo & Pulitzer Prize – during Russia, a part of Europe or apart from Europe? “In my parish I meet more ‘others’ than anywhere else: more Poles, migrants and diverse people, than at the Concertgebouw or over coffee at a café” – Dutch writer Vonne van der Meer during Faith in Europe: Is Europe losing its soul? For visual material please contact communicatie@debalie.nl. Were you not able to attend Forum on European Culture 2018 or would you like to rewatch a programme. Click here for the recordings. Last weekend saw the second edition of the Forum on European Culture: ‘Act for Democracy!’, jointly organised by De Balie and DutchCulture. At a crucial juncture in European history, cultural institutions in Amsterdam joined forces to celebrate European culture. To give an impression of the contributors: artists Santiago Sierra, Natalia Kaliada, Hans Kesting, Ivo van Hove, Lars Eidinger, Wolfgang Tillmans and Rem Koolhaas took to the barricades. 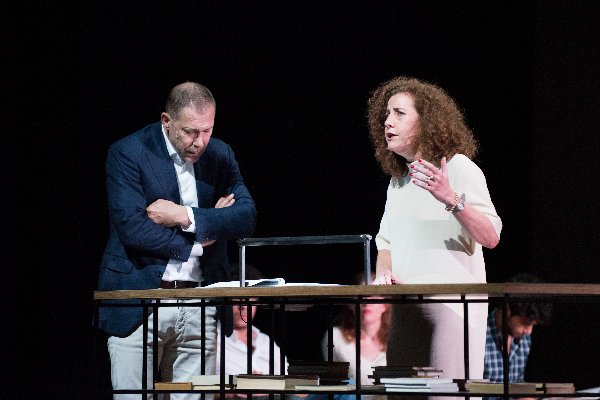 Critical thinkers voiced their views, such as Ulrike Guérot, Srecko Horvat, Flavia Kleiner and Arnon Grunberg. There were performances by the incomparable singer WENDE, the Nederlands Kamerkoor and Balkan Beats pioneer Shantel.Dutch Minister of Education, Culture and Science Ingrid van Engelshoven made her acting debut on stage; and many more inspiring thinkers and makers came together for this four-day festival on Europe and its future. Visit the website www.cultureforum.eu for more information.